Last Sunday night, around 8pm and it was raining light, while me and my Muah were heading to SM Southmall to buy me a Fitflop we already crossed the street (we're on the in between lane in the middle and there's no overpass nor pedestrian lane, as in people usually cross there every now and then) I just felt a sudden numbness and when i opened my eyes, i realized I was on the middle of the road- My Muah is screaming like hell and I heard loud poundings on the vehicle. I didn't realized first that I've been hit. My concern is that I should get up or else I will be hit by an incoming car- As i forced myself to get up, I really felt the pain on my left leg and that's the time I shriek in pain. Good thing that the people responsible quickly asked my Muah to hurry and get me immediately in their van to rush me to the hospital. It's a weird feeling really... When you're in pain and you can't move your leg and you're not aware of what really happened. I thought of my 2 kids first, on what will happen to them when I die. Who will take care of them If i became critical......I never imagined myself in that situation until last Sunday night. I thought I would only see it on TV and read on newspaper. The owner of the van admitted that he overtake that's why he went past the lane and hit me. Maybe the good Lord is so good enough that I am still alive. That nothing worst happened aside from swelling of my hip and the left side of my is aching like I've been on a workout. 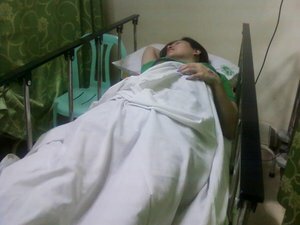 I was still on a first aid stretcher (the orange thingy) and they gave a pillow only when we requested it. I still don't want to remove my slippers. (ampanget ng talampakan ko LOLz!) Yeah, this is the reason why we headed to Southmall in the first place. To buy a new one. 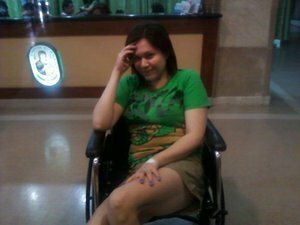 I really thank God that I only suffered minor injury. Or else, I will undergo on an operation in which they will put a metal thingy on the sucket that's been fractured and I will be on therapy for months and will be on a saklay. I still managed to smile in relief that I am still alive. God is really good all the time!